Within 250 miles of Pasadena, MD. The most important part of every race is the start! 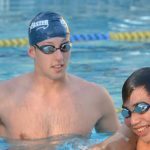 At this swim clinic National Champion Austin Surhoff will teach the technique your swimmer needs to know to blast off the block, power through the underwater dolphin kick, and explode ahead of the competition at the breakout. He will also give a talk covering nutrition and hydration for maximum performance. Blast off the blocks, into underwater dolphin kick, and breakout ahead of the competition at this swim clinic designed to help competitive swimmers improve upon the key details that are essential to swimming fast and improving their times. National Champion Austin Surhoff will teach all participants the drills that they need to practice to master these skills. DIVE: Get off the blocks faster and with more speed and power by learning the techniques of Austin Surhoff! Your swimmer will learn to set up on the blocks in a position that will allow them to explode forward. Make sure to be fuly engaged in the air as you throw your hands forward into a tight streamline. Your swimmer will learn drills and exercises that will help make them faster at this clinic! UNDERWATER DOLPHIN KICKING: The fastest swimmers in the world dolphin kick off of their walls and breakout ahead of the competition. It's not as hard as you think. Austin will help swimmers improve their technqiue as well as commit to a number of kicks off of every wall so that they can imporve their underwaters now as well as in the future. NUTRITION: What you put into your body is what you're going to get out. Learn from Austin what kinds of foods are going to give you enough energy to get through those tough practices as well as swim meets! Hydration: Drinking plenty of water is often overlooked in water sports like swimming. You lose a lot of sweat over the course of a practice. Learn ways to make sure that you stay hydrated as well as what you should be drinking!